Maxi NAC Complex™ is here! “NAC” also known as Acetyl-L-Cysteine, has two components. One is L-Cysteine, which is an essential amino acid. Then it is combined with Acetyl (acetic acid) offering enhanced properties which neither enjoy by themselves. To enhance NAC’s antioxidant and other helpful benefits we added Selenium, Molybdenum and L-Glutathione. 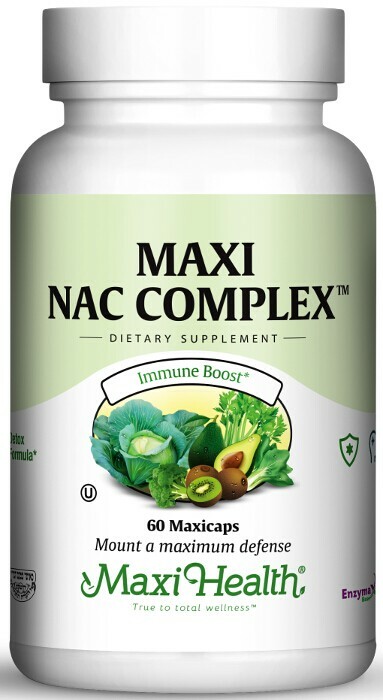 Our Maxi NAC Complex offers you support for liver detox, mucous, mood and behavior issues. It is also a great antioxidant! Don’t just settle for NAC, get Maxi NAC Complex™. Other Ingredients: Vegetable cellulose (capsule) , magnesium stearate, rice ﬂour. Enzymax®, a vital digestive enzyme complex, is a registered trademark of Maxi Health Research LLC.